At Fort Adams we were able to get a close up look at the frigate with our Guest stickers on our lapels We gained entrance to the huge tent for special guests. It was set up at the dock beside the frigate. Let us not forget that the arrival of the Hermione was a salute to our two countries, France and America, who had been covert friends before the 1776 Declaration of Independence. In fact the French covertly shipped arms and cash via the wealthy Marblehead, Massachusetts, shipping merchant Jeremiah Lee. His ships picked up war materiel in Spain contributed by the Dutch, the French and the Spanish, right up to the eve of the battle of Lexington and Concord. This day in Newport, we celebrate the alliance of France and America that has extended over a period of some 240 years at least. The dignitaries under the tent were many, some in French naval uniform, some in American Naval uniform, along with re-enactors sporting their colors representative of Revolutionary times and the rest of us in our best red, white and blue street clothes. With those three colors, one cannot go wrong as the tricolor is celebrated by both nations. Represented under the tent were those who gave brief addresses to welcome the Hermione and her wonderful crew. The Naval War College of Newport band played patriotic songs and anthems. Following the requisite speeches and thanks to the sponsors of this momentous event of huge proportion, we left the tent, hoping for some air to cool our brows. There was not much of that unfortunately. The late afternoon sun was unrelenting. We knew we would be welcomed aboard the frigate, but would have to stand in line even as “guests” that we were, so we opted out due to the incredible heat. Instead we posed for some photos by the masthead of the ship, a romping lion in coat of gold! This lion had led the way across the Atlantic in peace to make its way up the Atlantic seaboard from Yorktown, where the final battle was fought under the leadership of the stalwart General Rochambeau from France and his commander while in America, General George Washington. Moi in patriotic dress with Golden Rampant Lion Prow over my Shoulder. From left to right: David Beglan and his wife, Mary Conseur; my husband, John Lester Vail and moi. Don’t we look cool??? Well, we are far from it. We are in fact, melting before your eyes, while trying to show a stiff upper lip. The Frigate, Hermione, is really cool however, proudly showing her colors held out by a tiny breeze that seems to have missed the four of us! We finally left the dock at Fort Adams for the cool of our B&B, the Jailhouse Inn, where we showered and readied for a fine French repast in an air-conditioned restaurant. The four of us dined with David’s brother, Brigadier General (Ret) John L. Beglan an, Jr. his wife, Paquita; my daughter, Heather Woodring and my granddaughter, Jessie Woodring. We even had 2 Society of the Cincinnati families in our number. That night we chose the four star French restaurant, Bouchard’s. We were seated comfortably at a round table and enjoyed each other’s company for at least 3 hours! The Dover Sole is beyond belief! Stay tuned for the last segment of our inspiring Newport trip. Tracking the arrival of the Hermione was not all that easy! For days, even weeks in advance we followed up on the exhaustive list of Hermione events in Newport alone! What must it have been like in Philadelphia, New York or Boston? The plan for day 1 afternoon was to enjoy a fine lunch overlooking the entrance to the harbor at Newport. Ocean Cliff luncheon was a fundraiser for the Alliance Francaise of Newport and the Newport DAR. Since I was a member of both groups in CT I suggested to our group of 8 that we purchase VIP luncheon tickets well in advance, which we did. The day was forecast to have scattered rain off and on throughout the midday hours. We arrived at Ocean Cliff to find it was indeed on a cliff high over the water affording a perfect view of the ship when she sailed into view. We were thrilled until we found that there were so many people signed up that there were not enough tables inside. There were nearly 230 of us for lunch! Having signed up early we thought that seating would not be a problem, but when we reached the sign in table we found that we were seated outside! Scattered showers were forecast, and the sky was getting darker and darker. We alternated our sun hats and our umbrella until it was time to go inside to line up for the generous buffet lunch. Little by little we realized that the rain was subsiding as we exited onto the high plateau to find our large round table. We had ringside seats! We had an unobstructed view of the harbor. Moi of little faith! Soon everyone inside began to cluster around the huge windows while we simply sat in comfort to watch the unfolding of the scene before us on the water far below. 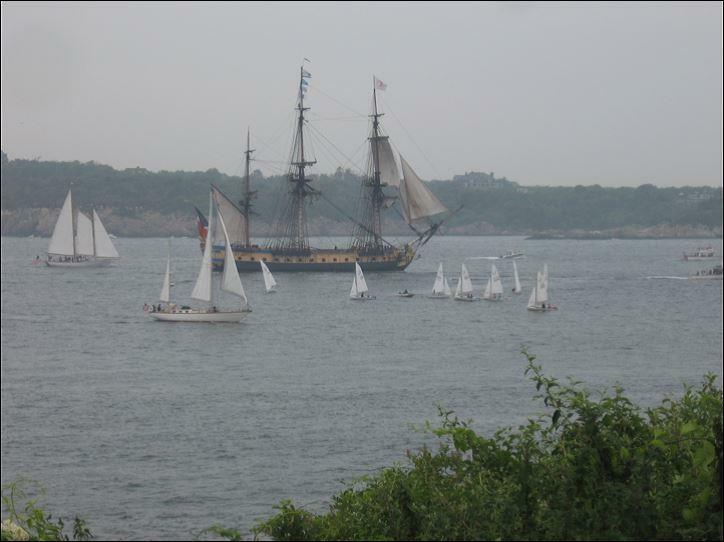 There she was at last, our first sighting of the Hermione, Freedom Frigate of the Marquis of Lafayette! My husband, John, must have been bitten by the get-the-best-photo bug, for I saw him disappear over the crest of the steep green lawn, not unlike that of Washington’s Mount Vernon, in pursuit of the closest shot of the frigate. 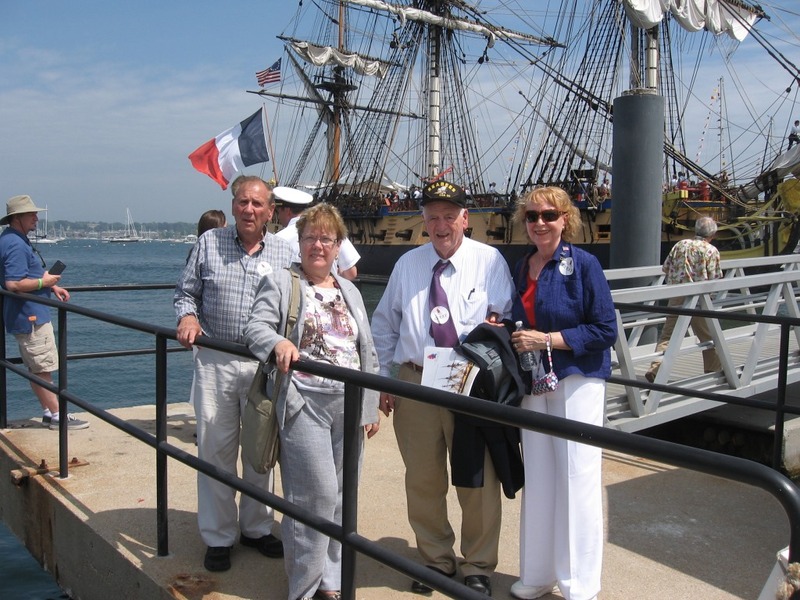 The French frigate was preceded by an accompanying sloop, then the firing of cannon to announce the arrival of this famous frigate that had come from so far away to spark our memories of America’s friend, Lafayette who came to help us fight for our freedoms. Then emerging from the trees that ringed the shore, into full view, was the Hermione! I had been waiting to feast my eyes on her for nearly 23 years. You could feel the thrill pass through us, the onlookers, as we cheered and then hushed to let the enormity of this event sink into our brains. We were witnessing history repeating it self before our eyes. It was a re-enactment par excellence! 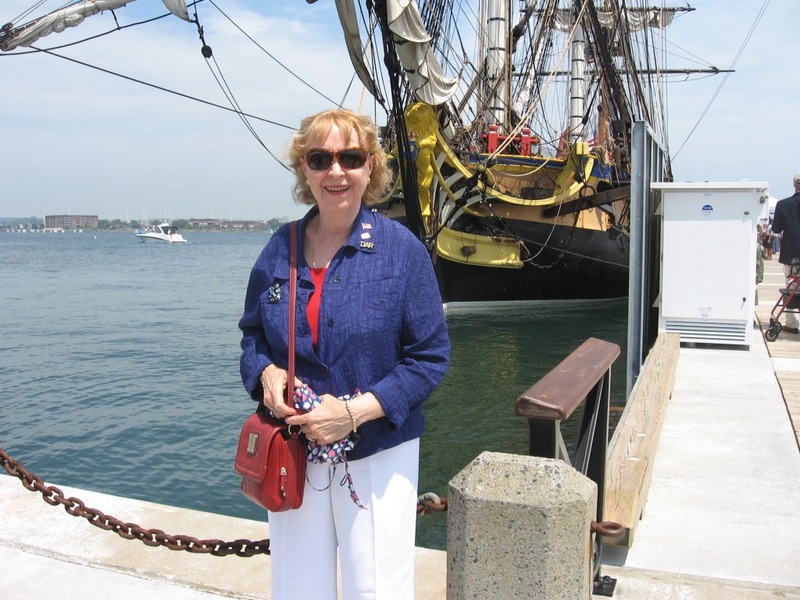 After about 2- minutes she passed out of sight as she headed for Fort Adams and her waiting dock. We turned to our food and to our personal reactions to this finely –planned arrival. No, Lafayette was not there in person, but there was a band playing French music and a general sense of good feeling between our two countries., France and America! Although France was our first friend in 1778, the liaison has been tenuous over the 2 plus centuries since. Even recently, relations have been strained. But today we put all that behind us and we sang the Star Spangled Banner and the Marseillaise together as one. Inside Ocean Cliff everyone gathered to thank all the local and French groups who supported this coming together of two old friends with speeches and much applause. We stood by the door with misted hair and teary eyes to add our applause to the whole. 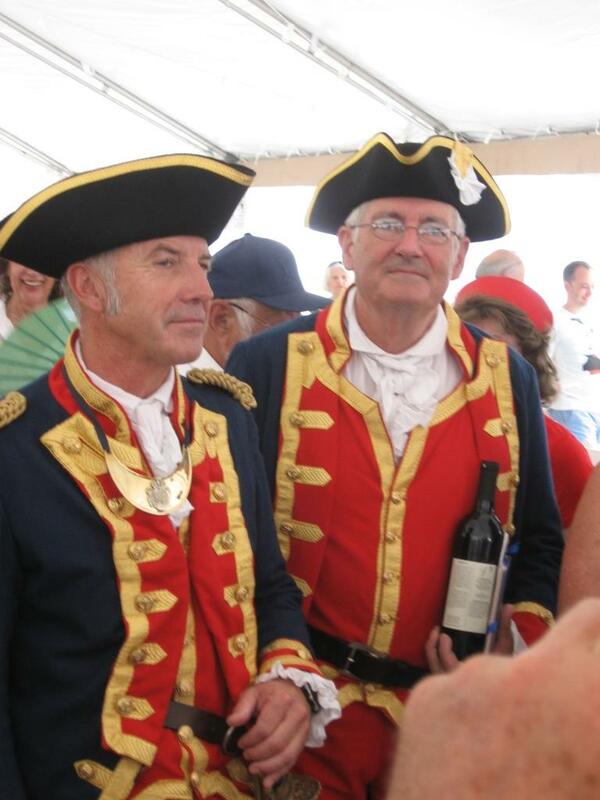 We salute Rhode Island locals, the supporters of Washington-Rochambeau Revolutionary Route (W3R), Lafayette Society, The Society of the Cincinnati, Sons and Daughters of the American Revolution and the many other groups who made this luncheon such a success! Huzzah! Mme. Segoleme Royal, President of the Poitou-Charentes Regional Council and Minister of France, refers to the 16 year building of the frigate: “Lafayette’s Frigate of Freedom as being brought back to life”. A beautiful arrival was celebrated by us all!